“Let’s speak truth,” Harris said. “We have seen an administration in our country over the last two years who claimed that they would be a friend of the LGBT community. But instead they remained silent when the LGBT community was attacked in Chechnya to Egypt. Let’s speak these truths. 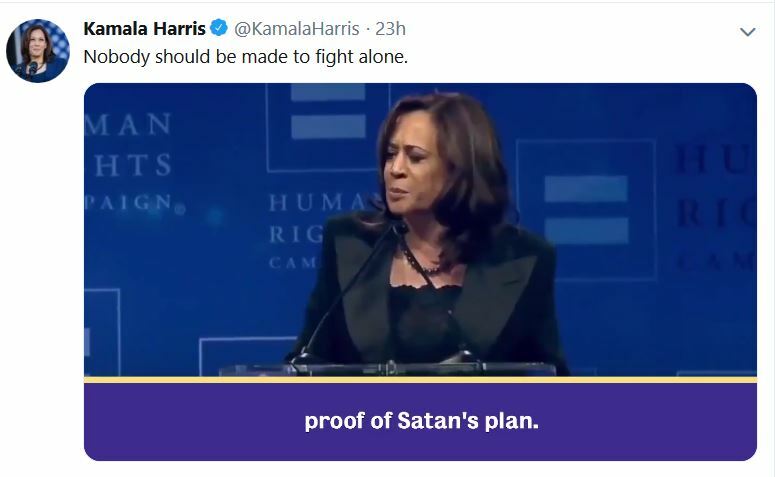 “Let’s speak the truth that there have been judges nominated—I am a member of the Senate Judiciary Committee—there have been judges nominated who called transgender children proof of Satan’s plan,” she said. In September 2017, CNN ran a story about Jeff Mateer, the first assistant attorney general of Texas, whom Trump had nominated to be a federal district judge. The story quoted a speech Mateer had given in May 2015 in which he expressed skepticism about transgenderism. Mateer’s judicial nominaton was withdrawn in December 2017. “Let’s speak truth. We have seen an administration in our country over the last two years who claimed that they would be a friend of the LGBT community. But instead they remained silent when the LGBT community was attacked in Chechnya to Egypt. Let’s speak these truths. Let’s speak the truth that there have been judges nominated—I am a member of the Senate Judiciary Committee—there have been judges nominated who called transgender children proof of Satan’s plan. Let’s speak the truth about the hate behind those words and the need to fight for what represents true justice in our country. Let’s speak the truth that it is not justice in our country when you ban men and women from serving their country who love their country and are prepared to die for their country. Let’s speak the truth about the need to restore truth and justice in our country. Let’s speak the truth, Chad mentioned it. Let’s pass the Equality Act in the United States of America and finally recognize that everybody should be treated under the law, and including by our federal government. Let’s speak the truth. Let’s speak the truth that the fight for LGBTQ rights is a fight for civil rights and until all of us are equal none of us are equal and none of us will receive justice.